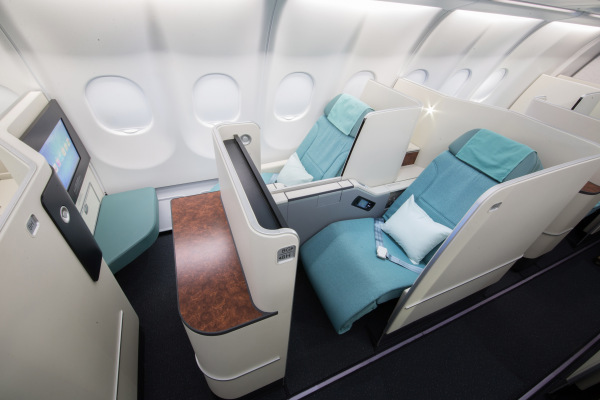 Korean Air is the latest carrier to embrace the new B/E Aerospace Apex business class suite. Following both JAL and Oman Air, Korean Air has opted for these increasingly popular forward facing private suites, which all offer aisle access and increased privacy. Just like Japan airline’s suites, Korean Air’s “Prestige suites” turn into 74 inch long beds. When not fully reclined, the seats are still a comfortable 21.6 inches wide and feature a 23 inch widescreen touchscreen TV with handheld controller too, so there is no need to reach to the screen. In a bid to improve and align their business class cabin with international standards, the biggest improvement comes from the introduction of a fully flat bed, replacing the older lie-flat seats.The new Suites will make their debut on a Korean Air A330-300 on the Guangzhou, Singapore and Hanoi routes. Korean Air has a further 38 aircraft on order – six A330-300s, twelve B777-300ERs, ten B747-8is and ten B787-9s – and all will be delivered equipped with these new seats. The airline also announced they will be looking at introducing a brand new first class product to compliment the new suites. 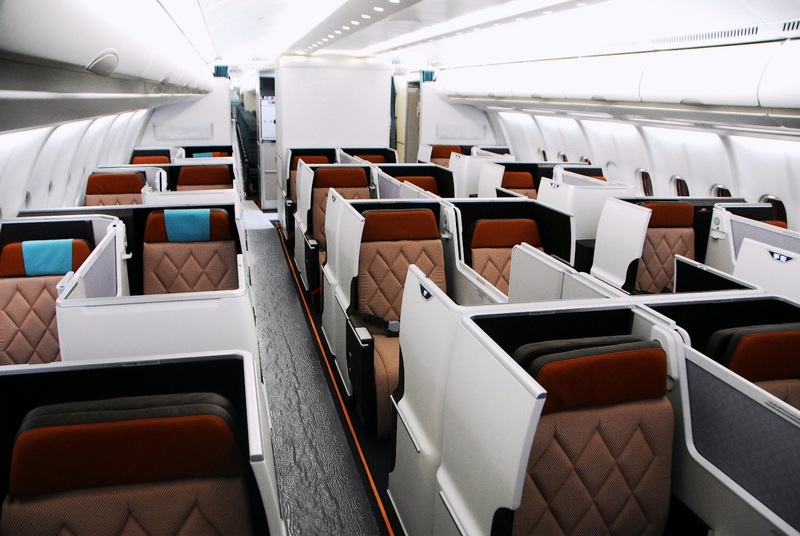 The advantage of these seats, (as shown above) in Oman Air’s new A330 business class cabin, is that passengers can either fly together or in complete privacy, in a similar set-up to British Airways’ long-standing Club World product. The centre seats align perfectly, whilst the window twin seats are staggered slightly, to ensure each passenger has access to the aisle. 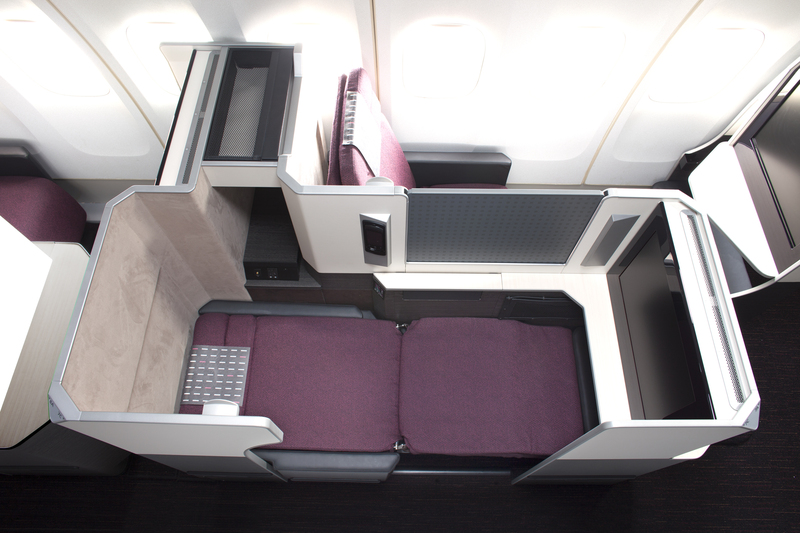 JAL’s suite (shown above) which is similar in design, offers a little more privacy, due to an extended partition at eye level, however the seat mechanics are identical, offering a fully flat surface, with ottoman for extended bed length, when the seat reclines the armrests flatten too to offer increased bed width, extending to just under 23 inches wide. With three carriers already touting this new seat design, only time will tell if more carriers adopt the new seats. From our point of view, this new seat is a great replacement for British Airways Club World, although the rumour mill may indicate they are going down a slightly different route. Nothing like having a fellow passenger breathing in your ear and just outside of your peripheral vision for 14 hrs.